It’s official! The third episode of Doctor Who’s new season will feature American civil rights hero Rosa Parks. 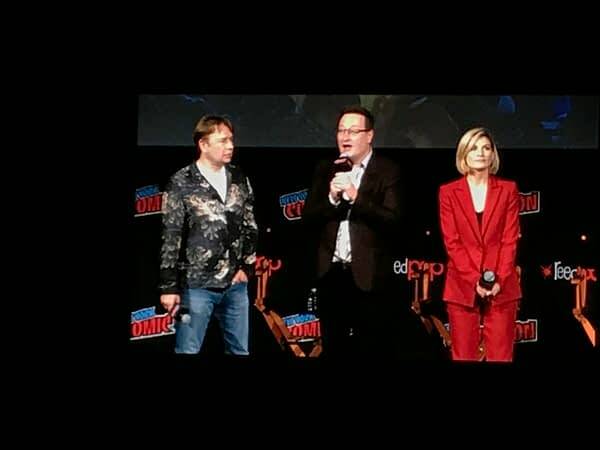 Showrunner Chris Chibnall confirmed the long-rumored news at the Doctor Who panel at New York Comic Con, following a live screening of the first episode at the same time it was simulcast to viewers around the world. With a newly female Doctor, one Chibnall says identifies as “gender non-binary,” and a supporting cast featuring three people of color (well, two now… spoilers), along with the show’s long history of pushing a progressive viewpoint, it’s no surprise that the new season would be primed to tackle civil rights issues, and that seems to be exactly what they’ve got planned in episode three, which is the episode that will feature parks. Said star Jodie Whittaker at the panel: misogynists are “just daft”. Bleeding Cool’s Adi Tantimedh and Amanda Gurall are sending us live updates on the panel, so stay tuned to Bleeding Cool for anything we can milk a standalone article out of. And if you missed the premiere (why???? ), BBC America is showing a special extended encore at 8PM Eastern tonight. The regular version is playing again right now (hurry up and tune in)!